Welcome to the very first edition of Word-Buff Stuff! In this newsletter I provide you with puzzles, tips, and some general chit-chat from the world of words and word games. A quickish, but still challenging, Word-Buff-style crossword puzzle. Basically, that means American-style, but without all the pop-culture trivia. So you don't need to know the name of President Nixon's dog. Why? Because Word-Buff is about Words! A Scrabble puzzle that will hone your anagramming skills and improve your Scrabble scores. 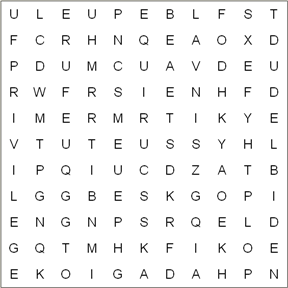 A wordsearch puzzle that will test your ability to spell commonly misspelled words, along with some that are not quite so common. NOTE... If you can't see the puzzle pictures further down in this newsletter, or if you see weird characters all over the place, it may be that your email is set up to only read plain text. If that's you, just pop over to the Members-Only Area of Word-Buff, where you can view the newsletter as a webpage. 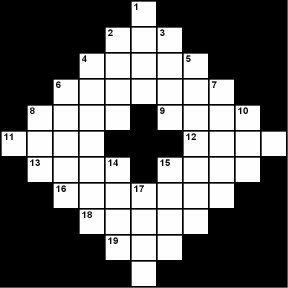 The Crossword Diamond is a standard American-style crossword puzzle. I've made sure that all of the answers are common English words and phrases, so the real fun will be in a few of the more playful clues. I've also avoided general trivia. When you're done, pop on over to the Members-Only Area, to check your answer. 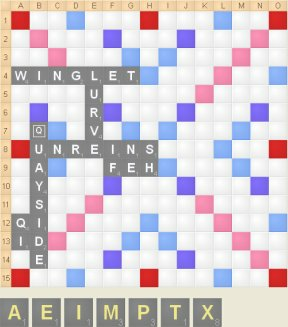 Take a look at the following Scrabble board, together with the rack below it, and find the highest-scoring move possible. Remember, I'm not asking about the best strategic move here - just the highest-scoring move. Note that even though the game is played to the Official International Scrabble Dictionary, I have constructed the puzzle so that the answer, along with all words formed in the answer, belong to the Official North American Scrabble Dictionary (which means they are also valid in the international dictionary). As with most of my spelling stuff, the authority I use for spelling and pronunciation is the Merriam Webster. If you're constructing a crossword, whether it's for your class, a small newsletter, or the New York Times, the substitution test is a quick rule to help decide whether your clues are grammatically acceptable. So what exactly is the substitution test? Take the answer to your clue, and think of a valid sentence containing that answer. Now simply substitute the exact clue for the answer in that sentence and see if it reads properly. If it doesn't, then your clue fails the substitution test, and you should rework it. It might seem obvious at first, but it really isn't, and many puzzles get rejected from newspapers because they fail it. Sound reasonable enough? Let's check. What do you think? Terrible huh? It sounded ok at first, but it's a big fat fail! Much better don't you think? It's not necessarily a great clue yet, but passing the substitution test is a critical prerequisite to becoming a great clue. Phew, it's finally out there! The very first edition of Word-Buff Stuff! I'm sorry to those of you who signed up a while ago and have had to wait this long to hear from me. I've been so busy getting Word-Buff off the ground, that it's taken me a while to get to the fun stuff. An About Me page. You see, I'm a bit of a private person, and I don't really like writing about myself. I don't even have a Facebook page! But more and more, I'm getting requests from visitors to tell them who the 'I' and 'Me' are in my pages. I have to admit, I virtually always look at the About Me pages of sites I visit. So I've decided to do one, and I hope to have it up in the next few weeks. I've set up a new page called The Word-Buff Blog. There's not much there yet, but you'll be able to subscribe to it, or just visit it when you're a bit bored, to get a quick overview of the additions and changes I've made to Word-Buff recently. I'm about to interview a couple of celebrity word-buffs on my site. Well, ok, I'm not talking about Brad Pitt or Paris Hilton. But in our little neck of the woods, I think you'll find they make interesting reading all the same. Finally... to get the most out of this newsletter, make sure you take a squiz at your Members-Only Area over at Word-Buff. Why? And speaking of that last one. I really hope you've enjoyed this first issue of Word-Buff Stuff!, and that you'll take the time to help me make Issue #2 even better. Want to take your vocabulary to the next level?